History and Philosophy of Biology; History of non-Darwinian evolutionism; Science Dissemination and Education. 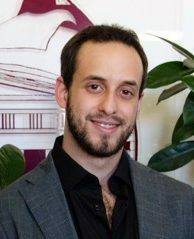 Ph.D in Historical, Philosophical and Social Sciences; teaching assistant in history of science at the University of Rome “Tor Vergata”; 2015-2016 CHSTM Research Fellow (www.chstm.org/profile/david-ceccarelli). My interests include the history of anti-Darwinian evolutionary theories, the history of paleontology, museology and science communication. Currently, I am member of the Consortium for History of Science, Technology and Medicine of Philadephia, the ESHS (European Society for the History of Science) and Res Viva (Interuniversitary Center of Historical and Epistemological Researches in the Biological and Medical Sciences). Ceccarelli D. 2018 “Between Social and Biological Heredity: Cope and Baldwin on Evolution, Inheritance, and Mind,” in Journal of the History of Biology. Springer, https://doi.org/10.1007/s10739-018-9522-2. Ceccarelli D. 2015 “Beyond the Conflict Thesis. Edward Drinker Cope and the Neo-Lamarckian Compromise in the 19th Century,” in Gosudarstvo, religiia, tserkov’ v Rossii i za rubezhom 33(4), pp. 36-54. Ceccarelli D. 2013 “Herbert Spencer e gli Stati Uniti: dalla Synthetic Philosophy alla metafisica del progresso,” Discipline Filosofiche: The Metaphysics of Positivism, XXIII, 1, Macerata, Quodlibet edizioni, pp.185-206.